Curling Today is going off for a few days break this week. So, Merry Christmas everyone, and thank you for your support this year. We'll be back soon. Before we go though, here's the Christmas post. 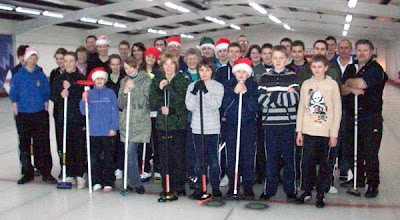 Greenacres Young Curlers held their Christmas Bonspiel last Saturday. With a full house, they played a four-end funspiel, with a panel of judges (a parent, a coach and the local Development Officer) observing how the participants performed. It was "Strictly Come Curling"! 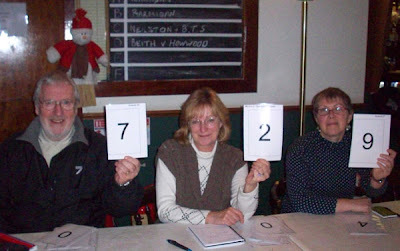 The three judges (Bruno, Arlene and Len) were not always in agreement. One curler was awarded 10 points by one of them for agreeing with an umpire, but was given 0 points by another on the basis that no young curler would actually admit to agreeing with the umpire! One judge awarded 10 points for a perfect hit and roll, but only 5 by another who thought the curler was showing off! You get the idea. 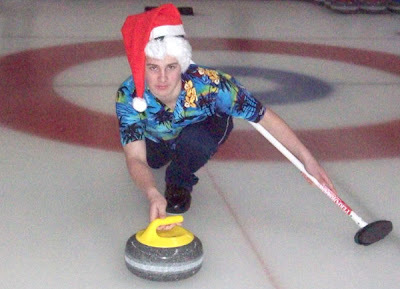 Top style points went to one curler (George McConnell jnr) for wearing a Hawaiian shirt and Santa hat! 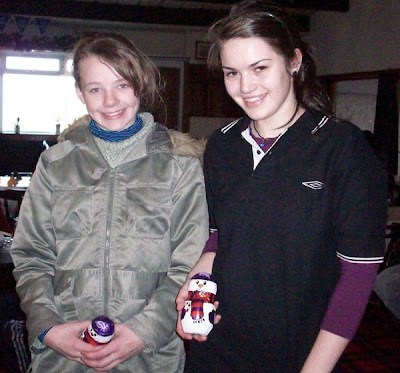 Heather and Claire were the Strictly Come Curling joint winners! But everyone was a winner for coming along and entering into the spirit of the event. Pics courtesy of Gordon McIntyre and Janice Howard. Lastly some international news. The prize for the rink with the best Christmas spirit must go to Fenton's rink in Kent, where the first International Santa Curling Championships were held. And what a great way to raise the profile of the rink, and of curling down south. Here's the proof. Click HERE to see the video! Merry Christmas! Ho, ho ho!